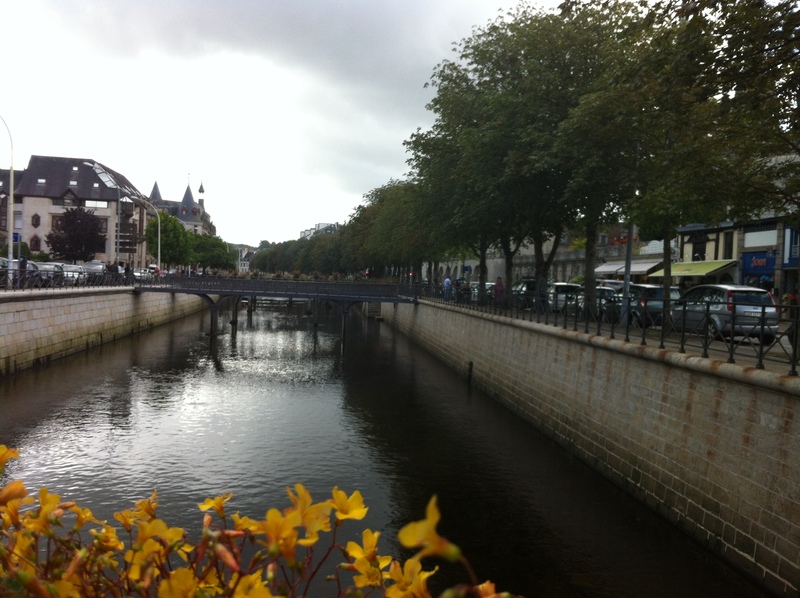 Pont Aven Washout & the Cathedral and the Bridges of Quimper. The day after Carnac, Mike and I drop Lindsey off at the train station to make her way home. It’s a sad moment, the Fellowship of the Mast is coming to an end. Later the same afternoon Mike and I take our rental car to visit Pont Aven. This pretty little town was made famous by Paul Gauguin and other visiting 19th century artists who made a sort of a colony here. There was even a School of Pont Aven. Brittany in general was to these artists what the West of Ireland was to WB Yeats; JM Synge and the rest of the literary Gaelic revival back in my own country. French artists and intellectuals, like their Irish counterparts and contemporaries, considered such relatively under-developed regions more “real” that is to say purer, uncorrupted by the evils of industry, by urbanism, and modernity. Pont Aven is still very pretty. But today alas, it is also an unbelievable tourist-trap. It is full of “art” galleries, selling pastiche of 100-year old work; overpriced cafes and endless, endless, souvenir shops, selling all manner of kitch and tat. Today, to complete this sorry picture, it rains in a constant heavy downpour. We get soaked to the skin. I could not bear to take any pictures. Well, I did take a few, huddled under a balcony somewhere. But they are far too dreary to publish here. It was interesting to see Pont-Aven – aplace i studied in art history – but I shall not be rushing back any time soon. 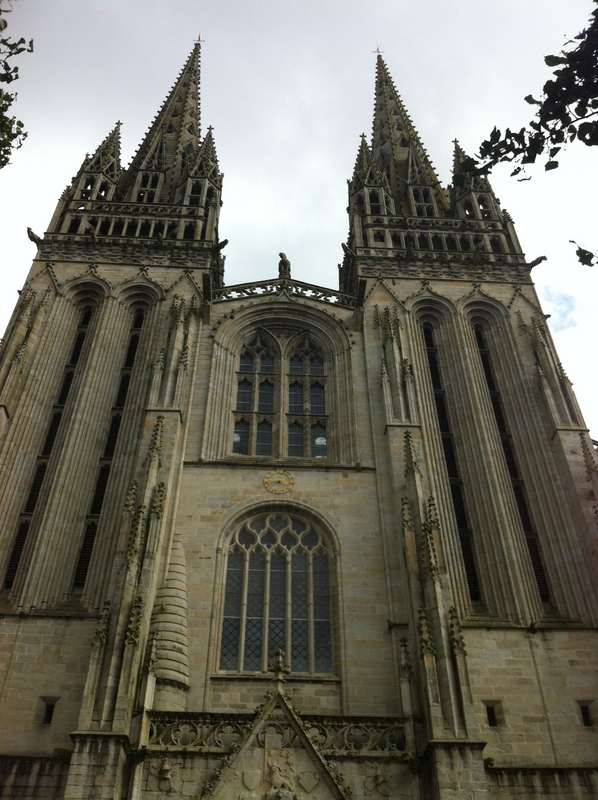 Quimper is not enormous by modern standards, but in medieval times it was an important city and so has -always the giveaway this- has the cathedral to prove it. The town is also famous for the large number of pretty bridges spanning the river, proudly hung with flowers. 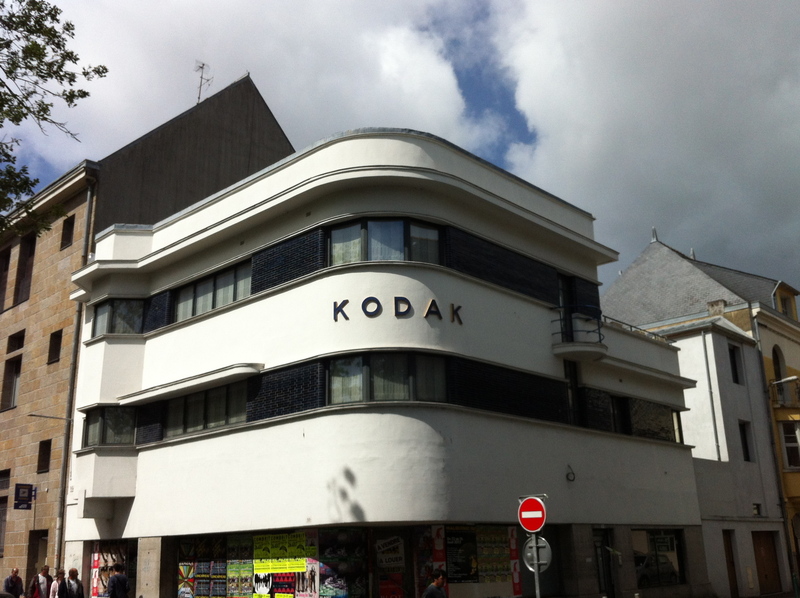 The first thing I saw however, was this old Kodak building. One of the few new structures by the river, it caught my eye. Approaching the cathedral it became apparent we were in for something special. 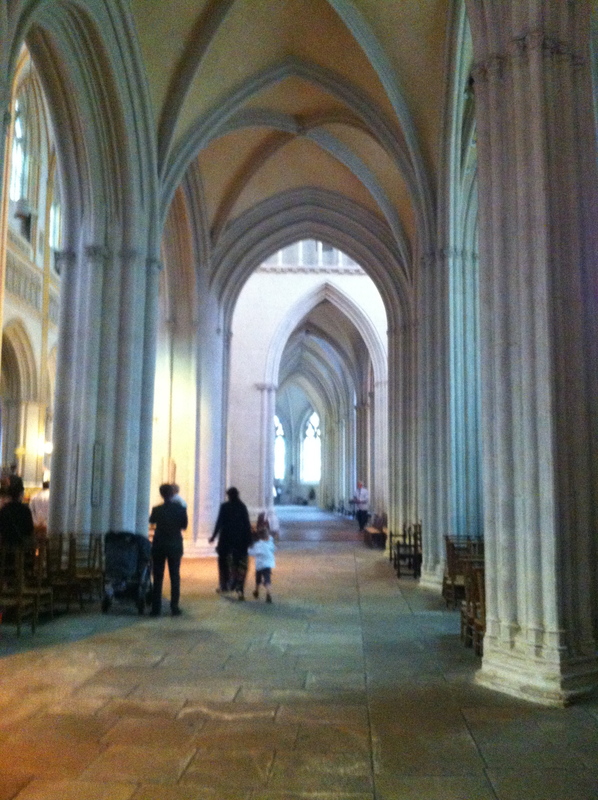 Look at these flying buttresses, these great, arcing columns of stone. They are unique to this period, to the highly-developed, Late or “Flamboyant Gothic” period, when master masons learnt magic with stone, transferring the huge weight of the blocks and the tall pitched roof downwards into the earth, through these amazing “flying” columns of pure stone. In an era before modern materials and re-enforced techniques, this still seems like magic to me. Incidentally we don’t have this sort of high-flamboyant Gothic in Ireland, not with flying buttresses. (You see it/them in France, Belgium, Germany and just occasionally in England, that’s it. ) I was very jealous. The area around the cathedral, below, is full of ancient, timber-frame medieval houses. Here is an equally flamboyant door, by the main entrance. 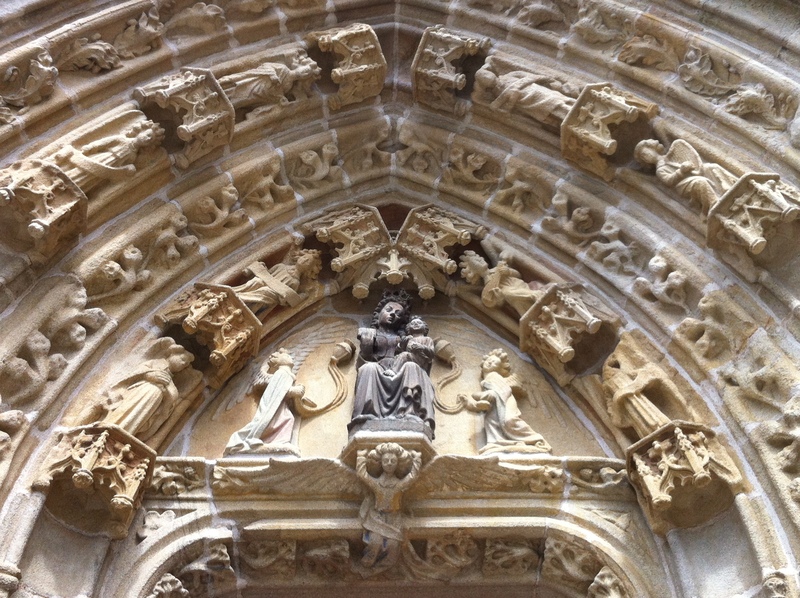 Look at the extragent carvings, if you are not too distracted by the chap in the tracksuit. I almost thought of asking him to move, but its a delicate point of etiquette. Why should he really? I am sure people have sat on these steps for centuries and he is probably a local. I decided the only way to catch the lovely detail on the same door was to get up very close. Very close. I’m sure I made tracksuit man very uncomfortable. Revenge was mine. No, I’m joking, I’m not that vindictive. Not while taking in these angels, cascading, in layers, either side of the arch. I like the way each one has his own sort of “mini-church” above and below. Okay, I am ashamed, mini-church is definitely not a proper art history term. And I am sure there is one. Which makes me feel worse. Still you can see the bits of framing architecture within the sculpture i mean. Closer detail of same. 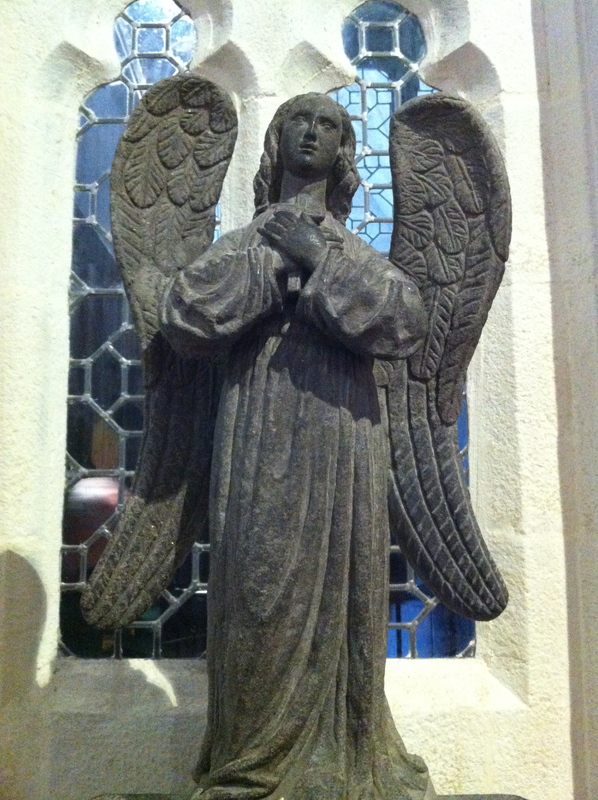 You will see that two especially privileged angels get to stand centre -stage, and to herald Mary the Madonna You also have to love the angel who has the job of supporting her throne from below. If you look carefully, he looks proud, almost defiant. I love the face of Mary herself too. It is a specifically medieval way of representing, imagining the face, imaging people. so different to a face you might find in the art of Renaissance Italy say. More innocent and ineffably sweet. I love it. 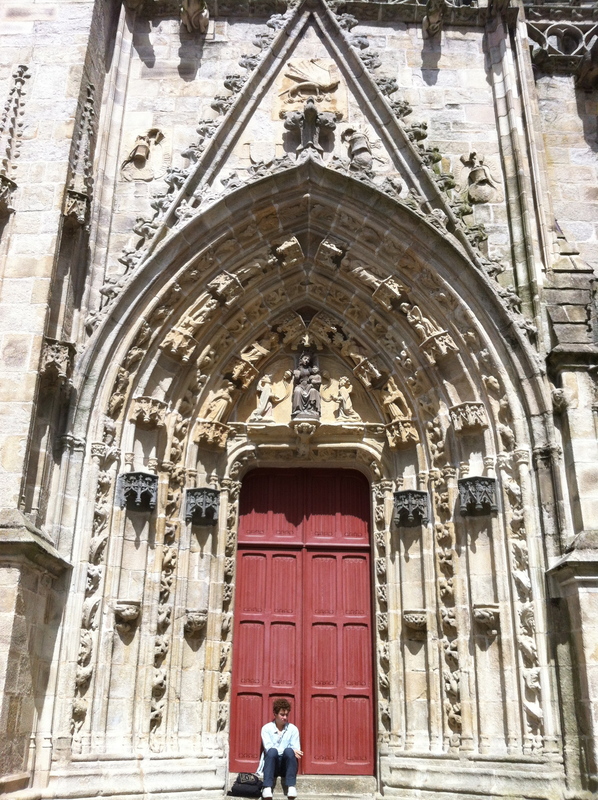 The facade of the cathedral was surprisingly severe. 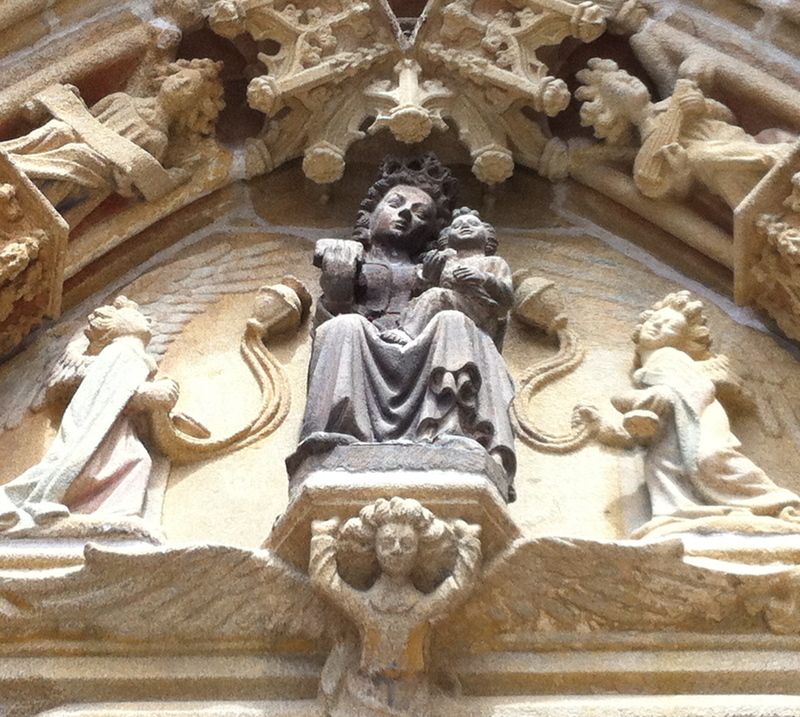 But inside the main door of the Cathedral was these lovely sights below. There was a wedding on, what a lovely place to get married. I posed as the unofficial photographer. But I doubt anyone minded. Weddings are full of happy snappers these days. That’s it from Quimper. 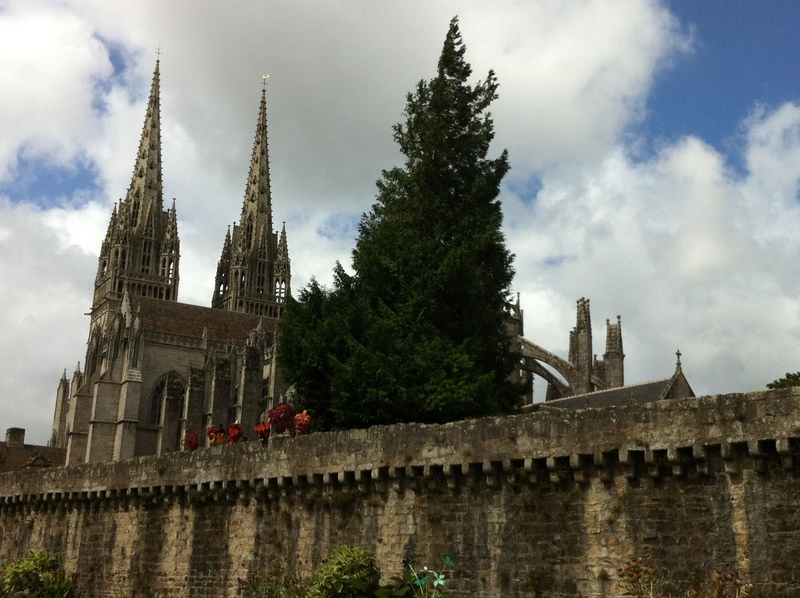 Next stop: the ancient Ducal, formerly Royal city of Nantes. 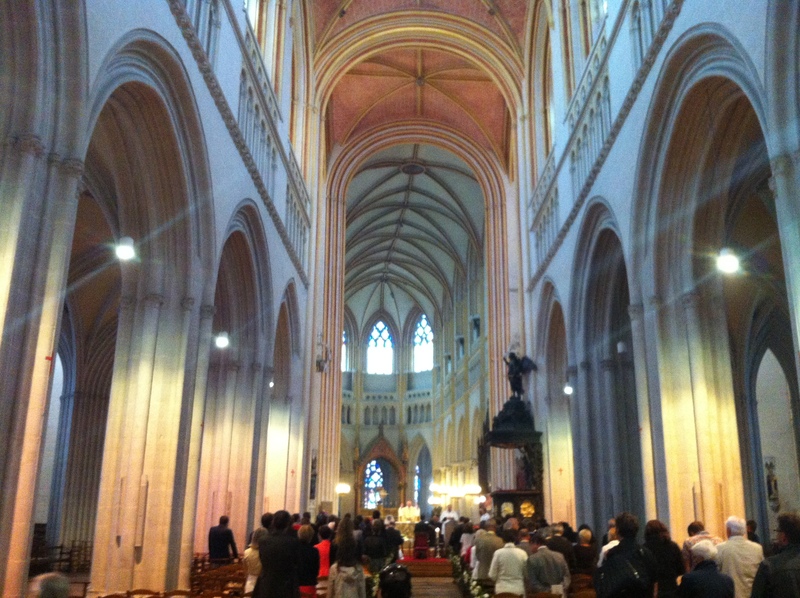 And if you think the cathedral above is impressive…..
Just extraordinary. It’s true, there’s something more approachable about Medieval art than the stuff from the Renaissance era. I love Gothic architecture as well as medieval wood and stone structures. That’s why I always go berserk in England and France. And as A Spare Mind said, American architecture is woefully devoid of both, as you can imagine. 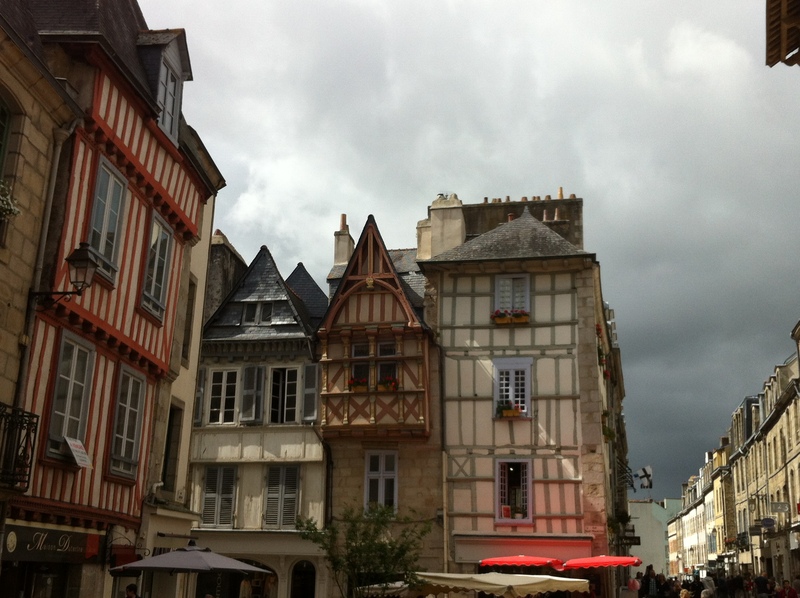 Next Post Goodbye to Concarneau, hello Nantes and home.